Grace Ibitamuno is first author on a paper in Journal of Cancer Education, September 2018. “To Care and to Provide Care." 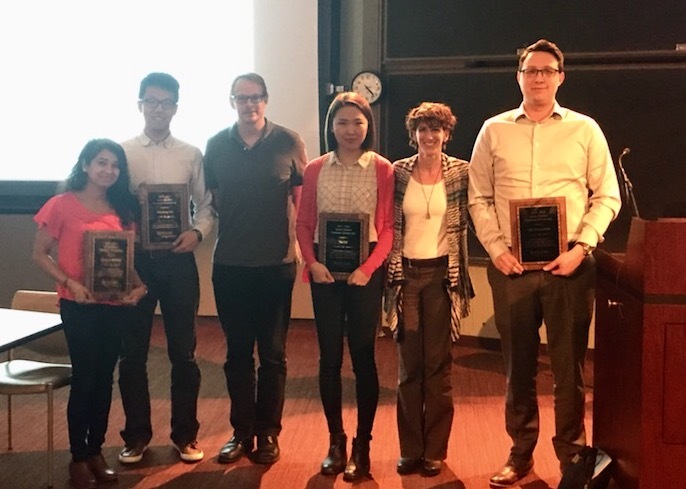 The winners were Apoorva Halikere from Zhiping Pang's lab, Yuanwang Pan from Ken Irvine's lab, Na Cai from Loren Runnels' lab, and Ilija Melentijevic from Monica Driscoll's lab. Presented on November 14, 2017. Matt Kraushar, an MD/PhD candidate has been awarded two grants as a principal investigator. Dr. Kraushar's studies will be conducted at Charité - Universitätsmedizin, Berlin, Germany, as part of his European Molecular Biology Organization (EMBO) Postdoctoral Fellowship. Mary Beth Bird, an MD/PhD candidate was awarded the Bigel Fellowship from the Department of Anthropology and the Graduate Enhancement Grant from the Center for African Studies, both at Rutgers, to continue her research on women and HIV/AIDS in Lesotho, Africa, during a summer fellowship. Jinhee Park is first author on a paper in Methods in Molecular Biology, July 2017. "In Vitro Modulation of Endogenous Alternative Splicing Using Splice-Switching Antisense Oligonucleotides." Today, the Rutgers Board of Governors approved the merger of the Graduate School-New Brunswick and the Graduate School of Biomedical Sciences. As of July 1, 2017, these two schools will merge to become the new School of Graduate Studies, an administrative unit that will serve over 5,000 students enrolled in 63 doctoral and 75 master’s programs spread across New Brunswick, Newark, and Piscataway. This merger represents the culmination of a process that began in 2013 with the integration of Rutgers University and the University of Medicine and Dentistry of New Jersey. It offers us a unique opportunity to combine our staff and consolidate our resources, to build support for interdisciplinary initiatives and collaborations, and to assist our students as they complete their graduate programs and prepare for professional careers. More importantly, it allows us to better serve the members of our communities by addressing more directly the challenges facing graduate education in the 21st century. Amidst rapidly changing labor markets, there are fewer tenure-track job opportunities. However, the demand for highly-trained professionals with advanced degrees has never been greater, affording our students a broad range of career paths on which to embark following their training. 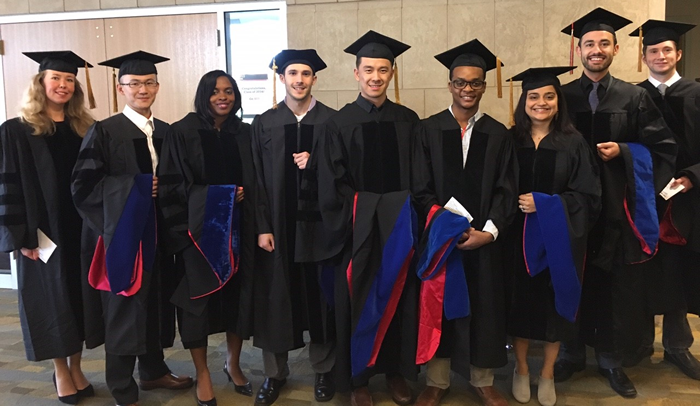 With the creation of the School of Graduate Studies, we will be as committed as ever to the rigorous graduate training that has made Rutgers one of this nation’s leading research universities. We will anticipate the future needs of our students in order to help them thrive in a global economy where success depends on their cultivation of wide-ranging skill sets, and we will take advantage of the broad and deep expertise of our graduate faculty to develop a more interdisciplinary approach to graduate education. Providing administrative oversight for nearly 140 graduate programs, we will continue to partner with our faculty and staff in order to train Rutgers students to think critically, to write effectively, and to work independently. We will also look for ways to build new innovative programs that will better prepare our students as they transition from graduate classrooms and labs into increasingly competitive labor markets. Like its predecessors, the School of Graduate Studies will exist to foster new ideas and create new knowledge. With our new, integrated school, we are determined to be at the forefront of graduate education, and we are excited to serve our students, faculty, and staff in this new capacity. To learn more about the creation of the School of Graduate Studies, read the Rutgers Today news release. 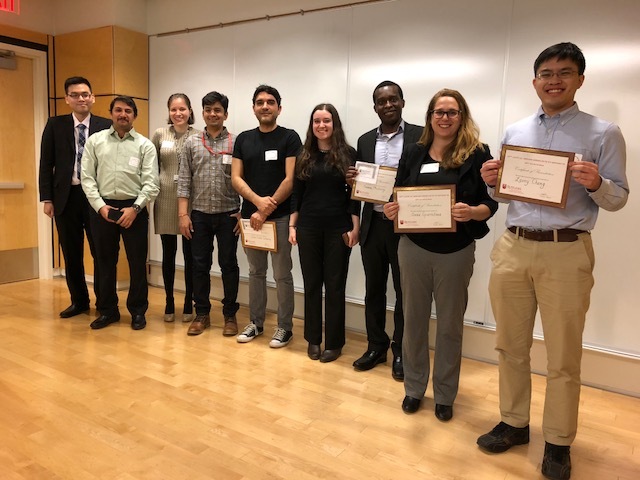 The Joint Molecular Biosciences Graduate Student Association held its 11th annual symposium on March 24 and the winners for best poster include Urmimala Basu and Anna Giarratana. The winner of the best oral presentation was Alexandra Nguyen. Sarah Misenko received an Executive Women of New Jersey Scholarship. 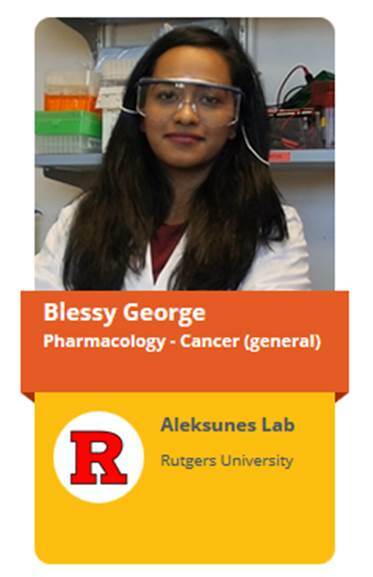 Blessy George is first author on a paper in Advanced Drug Delivery Reviews, January 2017. “Xenobiotic transporters and kidney injury. Kyle Saitta received an NIH F31 fellowship "The role of CHPG in oligodendrocyte regeneration" in November 2016. Aditi Dubey is first author on a paper in PLoS One, November 2016. “The Selenocysteine-Specific Elongation Factor Contains Unique Sequences That Are Required for Both Nuclear Export and Selenocysteine Incorporation." Jonathon Brzezinski is first author on a paper in the Journal of Neuroscience, October 2016. “Phosphorylation requirement of murine leukemia virus p12. Tips and Best Practices for Writing and Publishing a Scientific Paper including how to address new rigor and reproducibility criteria. Welcome to the PhD and MS class of 2016!!! Caroline Pantazis received an NIH F31 fellowship "Role of Lateral Hypothalamus Orexin Circuits in Cocaine Demand" in August 2016. Alexandra Legeza Nguyen received an NIH F31 fellowship "Investigating the Discrete Functions of the Aurora Kinases in Meiosis I" in July 2016. This year, as in the past years, GSBS mentors trained EIGHT BCP Access Med students for 4 weeks in their laboratories. All the students presented their research findings at the Student Research Symposium held on July 15, 2016 in the West Lecture Hall. The Biomedical Careers Program (BCP) is an intensive six-week summer program offering academic enrichment in the sciences and health care orientated activities. BCP offers three levels of coursework and six different curricula for students at various stages of their undergraduate education. Each level includes a combination of lectures, laboratories, clinical correlations, and small group sessions. Przemyslaw Swiatkowski received a NJ Commission on Brain Injury Research Fellowship "The Role of Cypin in Recovery of Electrophysiological and Cognitive Functions followint Traumatic Brain Injury" in June 2016. Lisheng Zhou has an internship at Genewiz for the summer of 2016. Almin Lalani has an internship at Novartis for the summer of 2016. Fei Wang has an internship at Tesla Motors, Inc doing data science for the summer of 2016. Yuan Liu has an internship at Genentech for the summer of 2016. Congratulations to all of the first and second year PhD students who have completed their Qualifying Exams (Parts A and B)! Urmimala Basu received an American Heart Association Fellowship "Mechanism and regulation of human mitochondrial DNA transcription" in May 2016. Congratulations to our 2016 graduates and award winners! Eva Rubio-Marrero got a job at Celgene. Ina Nikolaevagot a job at Nucleus Global in March 2016. Andrea Gray, FDA in the Center for Biologics Evaluation and Research. Blessy George, Heather McGowan, Xia Wen and Appoorva Halikere PhD Students studying at the Graduate School of Biomedical Sciences, have been featured by LabTV’s “The Human Faces of Medical Research” podcast series. LabTV is working to inspire the next generation of great young scientists by featuring the personal stories of young medical researchers in NIH-funded laboratories. Please click on individual profiles for video. Vince Mirabella received an NIH F30 award "Endoplasmic Reticulum Stress as a Novel Mechanism of Synaptic Dysfunction in Autism Associated NLGN3 R451C Human Neurons" in February 2016. 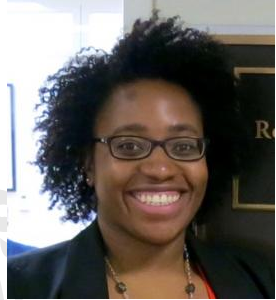 Olufunmilola (Funmi) Ibironke received a United States Environmental Protection Agency Science to Achieve Results (STAR) Fellowship for Graduate Environmental Study entitled "Air Pollution Particulate Matter Effects on Adaptive Human Antimycobacterial Immunity" in February 2016. Congratulations Jeremy Tang for receiving a NJCCR pre-doctoral fellowship entitled "TRIM33's Role in DNA Repair and Endogenous Retrotransposon Suppression" in January 2016. Ashley Pettit is first author on a paper in PLoS One, December 2015. Disrupted Nitric Oxide Metabolism from Type II Diabetes and Acute Exposure to Particulate Air Pollution. Congratulations! The Ernest Mario School of Pharmacy Summer Research Fellowship Program was awarded another R25 grant from the NIH in November 2015. Congratulations to the Shatkin Winners! Katherine Morgan - MD/PhD student in the lab of Sharon Pine. Andrea Gray accepted a job at the FDA in the Center for Biologics Evaluation and Research / Office of Tissue, Cell, and Gene Therapies / Cell Therapies Branch in October 2015. Michael Pellegrini is first author on a paper in Tissue Engineering. Part C Methods, September 2015. " The Effect of Swelling Ration on the Coulter Underestimation of Hydrogel Microsphere Diameters." To view the slides about GradFund, click here. To view the slides about NIH review of pre-doctoral fellowships, click here. For a summary of NIH criteria, click here. 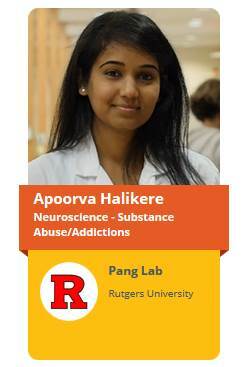 Apoorva Halikere was awarded an F31 NIH Grant "Neuronal basis of OPRM1 A118G polymorphism in alcohol use disorders" in August 2015. Aaron Merriam is first author on a paper in The American Journal of Sports Medicine, August 2015. “Successful Total Meniscus Reconstruction Using a Novel Fiber-Reinforced Scaffold: A 16- and 32-Week Study in an Ovine Model”. To view the slides from the PhD Orientation presentation, click here. To view the slides from the Scientific Ethical Conduct presentation, click here. Na Cai received an American Heart Association pre-doctoral fellowship "Regulation of TRPM7 channel kinase by 14-3-3 proteins" in July 2015. Christina Ramirez was accepted to do an internship at the Institut Pasteur Korea in the summer of 2015. She will be working in the Hepatitis Research Laboratory Group led by Dr. Marc P. Windisch. Eva Rubio Marrero was accepted to do an internship at Eli Lilly for the summer of 2015. Chenchao Gao was accepted into the summer internship program for the Office of Clinical Pharmacology at the FDA for the summer of 2015. Leonardo Valdivieso-Torres published an article in ASBMB Today June 2016 "The truth only goes so far. Scientists need to do more to increase scientific literacy in their communities". Leonardo also received a travel award and honorarium as part of the Biotech Literacy Bootcamp at UC Davis in April 2015. Jessica Fellmeth is first author on a paper in Molecular Human Reproduction in May 2015 " Expression and characterization of three Aurora kinase C splice variants found in human oocytes." Divya Nandakumar is first author on a paper in Elife in May 2015 " Cooperative base pair melting by helicase and polymerase positioned one nucleotide from each other." Two students, Alexandra Kenefake and Ashley Millette, from our Master of Biomedical Science program have been selected for the USAID-RU fellowship. They have chosen to pursue research at the Universitas Padjajaran in Bandung Indonesia. While Ashley reached Bandung on the 15th of June 2015 Alexandra is scheduled to arrive there on the 5th of July. Mihir Patel was awarded a NJ Commission on Brain Injury Research Pre-doctoral Fellowship "Recovery of the dendritic network after traumatic brain injury" in May 2015. Valentina Dal Pozzo received a NJ Commission on Brain Injury Research Pre-doctoral Fellowship "Role of Reelin in traumatic brain injury" in May 2015. Jonathan Cruz won the Stanley S. Bergen Medal, Jason Schifano won the Dissertation Excellence Award, and Matthew Kraushar won the Outstanding Teaching and Service award at GSBS Convocation in May 2015. Congratulations! 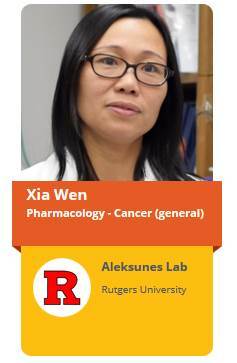 Tzung-Ju Wu is first author on a paper in Cell reports in April 2015 "Identification of a Non-Gatekeeper Hot Spot for Drug-Resistant Mutations in mTOR Kinase. Kathryn Drzewiecki, Chris Lowe, Andrea Gray, Serom Lee, and Sarah Misenko created a team for the Mid-Atlantic Case Competition. This competition is for non-MBA graduate students to develop consulting case solving skills. It is hosted by the Graduate Student Consulting & Beyond Club at UVA and the Fellow Consulting Club at the NIH. They were selected as one of the 20 teams to compete. They have one week to put together their strategy they present at the NIH. Major consulting firms such as BCG and McKinsey are sponsoring the event and were available for networking. Katie Morgan was awarded an F30 NIH Grant- "MicroRNAs mediating Notch signaling in lung adenocarcinoma" in April 2015. Evelyn Okeke received a National Science Foundation Graduate Research Fellowship and Katelyn Marshall received an Honorable Mention for the NSF Fellowship in April 2015. Both Evelyn and Katelyn are in the laboratory of Kiran Madura. 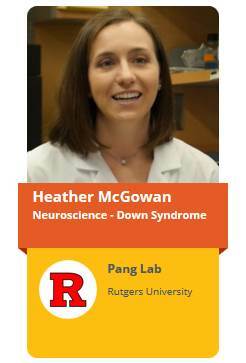 Heather McGowan was awarded a travel stipend in April 2015 from The 1st International Conference of the Trisomy 21 Research Society: "Changing Paradigms in Down Syndrome" in Paris, France. 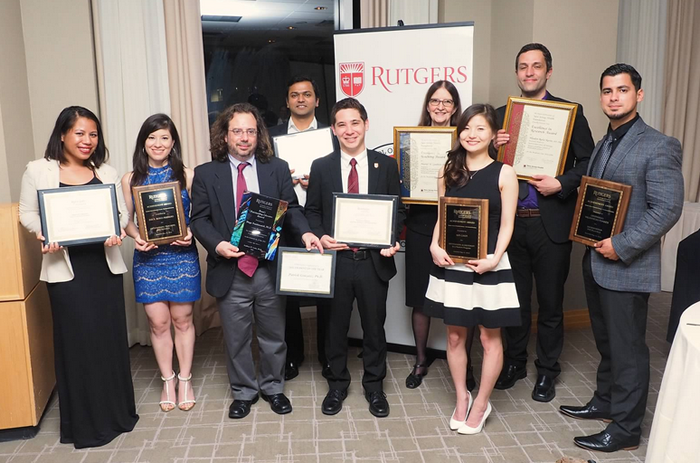 Matthew Kraushar, Phil Tedeschi and Qian Wu have each received the inaugural Shatkin Awards for excellence in research in April 2015. Each graduate student will receive $1500 to supplement the graduate stipend and $1500 for educational purposes. Shanique Edwards will be a Biology Science Writer at Draw it to Know it Creative LLC in Indianapolis, IN. DITKI uses a visual-based approach to learning to create supplemental learning material for medical students. Michelle Sempkiowski received a Graduate Student Fellowship in March 2015 from the New Jersey Commission on Cancer Research studying a new binding geometry on liposomes that has the potential to selectively and effectively target and kill cancer cells with low or too low receptor expression. Qian Wu, Philip Tedeshi, and Matthew Kraushar with Jim Millonig. Dharm Patel and Sarah Misenko who are both in the lab of Sam Bunting each received a Graduate Student Fellowship in March 2015 from the New Jersey Commission on Cancer Research. Dharm's grant is "The Function of Bloom Helicase in Mammalian DNA Double Strend Break Repair" and Sarah's grant is titled "Testing the Contribution of DNA Double-Strand Break Resection Factors to DNA Repair in Mammalian Cells". 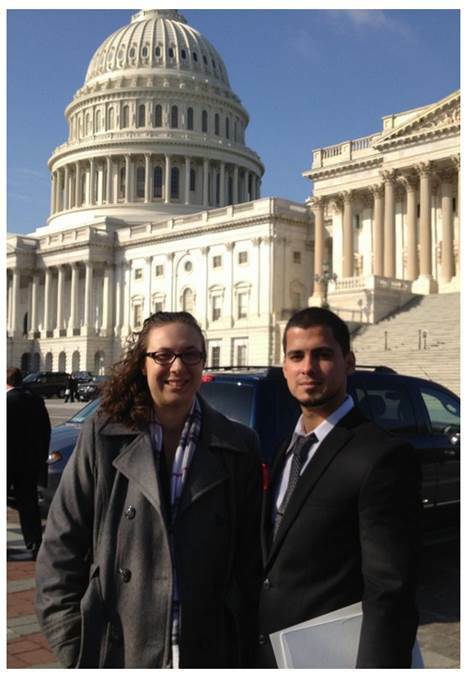 Graduate student Leonardo Valdivieso-Torres wrote an article entitled "Science Policy: Why Minority Science Students Should Care about Science Policy". 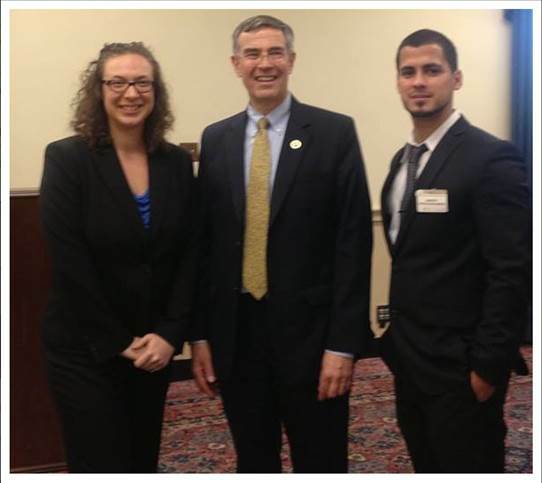 He and fellow graduate student Victoria DiBona spend a day on Capitol Hill through ASBMB to learn about lobbying for science. Click here to read the article. Great job Leonardo and Vicky! Christiaan de Vries is first author on a paper in Cancer Gene Therapy in January 2015 "The addition of recombinant vaccinia HER2/neu to oncolytic vaccinia-GMCSF given into the tumor microenvironment overcomes the MDSC-medicated immune escape and systemic anergy." Renea Faulknor is first author on a paper in Biochem Biophys Res Commun published in January 2015 "Mesenchymal stromal cells reverse hypoxia-mediated suppression of alpha-smooth muscle actin expression in human dermal fibroblasts". Michelle Cicchini is first author on a paper in Autophagy published in December 2014 "Autophagy regulator BECN1 suppresses mammary tumorigenesis driven by WNT1 activation and following parity". Dwaipayan Mukherjee is first author on a paper in PLoS One published in December 2014 "Physiologically-based toxicokinetic modeling of zearalenone and its metabolites: application to the jersey girl study". Kristina Hernandez got a job at MediTech Media which is a part of Nucleus Global in November 2015. Kristina Hernandez and Munjin Kwon are co-authors on a paper in Biological Psychiatry published in Nov 2014 "Nos1AP, a protein implicated in schizophrenia, controls radial migration of cortical neurons". Almin Lalani is first author on a paper in J. Immunology published in Nov 2014 "Myeloid cell TRAF3 regulates immune responses and inhibits inflammation and tumor development in mice". Michelle Sempkowski is first author on a paper in Crit Rev Oncology Nov 2014 "Liposome-based approaches for delivery of mainstream chemotherapeutics: preparation methods, liposome designs, therapeutic efficacy". Eastern Vascular Society Student Award for "Surgical Treatment of a Pancreaticoduodenal Arcade Aneurysm in the Setting of Chronic Total Occlusion of the Celiac Trunk"
Matthew L. Kraushar published in Proceedings of the National Academy of Sciences USA. "Temporally defined neocortical translation and polysome assembly are determined by the RNA-binding protein, Hu antigen R". We held our first iJOBS career panel in September 2014. The topic was Educational Careers with a Biology PhD. The speakers were Patricia Irizarry-Barreto, Tara Cominski and Lucille O'Reilly. For advice on how to prepare for careers in education, click here. Mentor: Chenchao Gao, Anuja George and Nancy Walworth, Ph.D.
Mentor: Kirk Pabon, Mgr. Res study and Jia Shi, Ph.D.
Mentor: Sagar Singh, Ph.D. candidate and David Shreiber, Ph.D.
Hanif Vahedian-Movahed is co-first author on a paper published in Science in June 2014 "Transcription. Interactions between RNA polymerase and the "core recognition element" counteract pausing"
Miao Chen published in Genes and Development in May 2014 "Coordination of tRNA transcription with export at nuclear pore complexes in budding yeast"
Heather McGowan received a F31 fellowship from the NIH in May 2014 "Synaptic function of Chromosome 21-encoded miRNAs"
Jason Schifano published in Nature Communications in April 2014 "An RNA-seq method for defining endoribonuclease cleavage specificity identifies dual rRNA substrates for toxin MazF-mt3"
Research (NJCBIR) in . Chris aims to improve neural cell survival and regeneration following injury using biomaterials that include different peptide fragments of BDNF. Chris is advised by Dr. David Shreiber. Erik DeBoer published in Journal of Neuroscience in March 2014 "Prenatal deletion of the RNA-binding protein HuD disrupts postnatal cortical circuit maturation and behavior"
Jonathan Cruz published in Journal of Biological Chemistry in March 2014 "Doc toxin is a kinase that inactivates elongation factor Tu"